The following video story about Local 210 Brother Kevin Smith was recently posted in the Meet Our Community section of nercc.org. To see more stories like this, visit the Meet Our Community page. The Carpenters Union gets the job done! First they helped it win approval, now they're helping it become a reality. Union carpenters in Bridgeport are now building the Fairchild Wheeler Multi-Magnet School, a combination of facilities and programs that are bringing excitement and hope to a troubled area. The building will be LEED Gold Certified and offer Aeronautics, Information Technology and Zoological/Ecological programs underwritten by corporate sponsors. 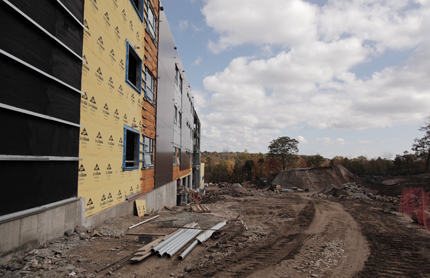 The 340,000 square foot building is the largest school project in Connecticut's history and is employing hundreds of local trades workers. 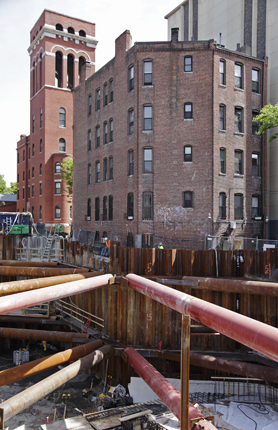 See more of this project and others in NERCC's Project Portfolio. 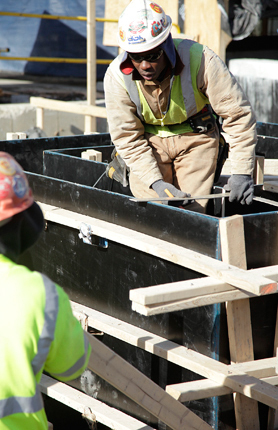 Misclassification has been a serious problem in the construction industry for years, and something against which the Carpenters union has led the fight locally, regionally and nationally. Union efforts resulted first in greater understanding and awareness among elected officials and now regularly lead to enforcement and publicity on the issue that is either directly a result of union action or an indirect result of efforts initiated by the union. Two items broke this week that reinforce that point. In Worcester, Telegram and Gazette columnist Clive McFarlane wrote about efforts by NERCC Organizer Manny Gines to chase down employers who cheat by misclassifying workers as independent contractors or cheat them out of their wages. McFarlane's column ties into an announcement earlier in the week by the Executive Office of Labor in Massachusetts that more they had found more than 2,300 workers misclassified by just three employers. Though the three companies were not involved in the construction industry, the eye-popping $11 million in unreported wages and millions of dollars the state should have received for unemployment insurance payments generated new stories that put the issue in front of the general public. John Leavitt, the Business Agent for Local 1996 in Portland hit the airwaves this week to promote the union and help a disk jockey fill time as he stays on the air for four consecutive days. The Mark-a-thon is an annual event held by WCYY's Mark Curdo to raise money for the Center for Grieving Children. CYY is one of the radio stations on which NERCC and the New England Carpenters Labor Management Program place ads to promote the union and industry standards. They also carry radio broadcasts of New England Patriots games, on which the union advertises. Leavitt was on air with Mark on Tuesday afternoon at 3pm. Through a partnership between Wentworth Institute of Technology and the New England Regional Council of Carpenters members can advance your career by earning an Associate of Applied Science in Building Construction Management. Courses are now being offered at the New England Carpenters Training Center in Millbury, MA. The program begins on January 7, 2013. To complete an online application visit www.WIT.edu/apply. To speak with an admissions counselor, please contact Ashley Roberts at 617-989-4651 or by emailing Robertsa2@wit.edu. For more information about oppoturnities available through this unique program, click here. News from the US Department of Labor on construction employment was slightly positive in October with the addition of 17,000 jobs in preliminary data. Jobs in the construction industry increased for the fifth consecutive month, reaching 5.53 million. The trend that could continue following rebuilding efforts tied to Hurricane Sandy. The industry still has a ways to go to reach employment levels enjoyed before the recession. Seasonally-adjusted employment numbers showed more than 7.7 million construction jobs through much of 2006, but then heavy, steady job losses in the industry from October of 2008 through February of 2010s. Since then, employment numbers in the industry have varied month-to-month between 5.45 and 5.56 million jobs. The Department of Labor's Bureau of Labor Statistics' website has an interesting graph and table tracking seasonally adjusted jobs in the construction industry, starting in January 2002. Yesterday was a good day for union carpenters across New England. Amazingly, all of the Council’s endorsed candidates won election. Obama swept the six states, including winning swing-state New Hampshire by a larger-than-expected margin. In the critical races -- Warren in Massachusetts, Murphy in Connecticut, Hassan/Kuster/Shea-Porter in New Hampshire, King in Maine, Cicilline in Rhode Island – our picks were all winners!! There is no doubt in my mind that some of the credit for these outcomes belongs to all of you and our members. We worked as hard as we ever have in an election season. We used all the tools available to us – new and old techniques – to educate and mobilize our members. And they responded. Door knocking, phone banks, rallies, visibilities, robo-dials, tele-Town Halls. We had a good story to tell…and we told it well and often. But it’s important to keep a clear-eyed perspective on where we stand the morning after Election Day 2012. In many ways, we “held serve”. We helped fend off the right wing Republican assault on the middle class. There should be a clear message to the nation’s anti-union forces that their philosophy is not welcome, that the voters do not buy an agenda that favors the wealthy over working families. Yet we still have a divided Congress; we still have a Republican Party that attacks unions. We have some new articulate champions but we also have some old foes. Paul Ryan is still chair of the House Budget Committee and there are no signs yet that the House leadership is prepared to move forward in terms of solving our country’s problems as opposed to scoring political points. So, as much as all of us deserve to take a deep breath and feel a justified sense of pride in our efforts, we will need to remain vigilant. The economy will not fix itself; it will require more federal and state action to invest in jobs and people. And it will require our continued involvement. Our members need to work; that’s why we endorsed the candidates who understood that the best social program is a job. Thank you all for your efforts these past weeks and months. It was worth it. Congratulations. Only two weeks ago, an ad for Elizabeth Warren featured Local 107's Jack Donahue. It was the latest sign that Elizabeth Warren and union carpenters share the same vision for the future of Massachusetts and the United States. This week, Donahue takes a backseat to Brother Richard Brow, another Local 107 carpenter featured in an ad for Elizabeth Warren. In the ad, Brow talks about the importance of creating jobs and how Scott Brown has voted no on multiple jobs bills since arriving in the Senate. Take a look and remember to share with all of your friends and family. Lean more about the Fairchild Wheeler Muti-Magnet school project by clicking here to view it in our online portfolio. The 2012 Carpenters Expo and Apprenticeship Career Day was held on Friday, October 19, at the New England Carpenters Training Center in Millbury, MA. 705 high school students, representing thirty-three schools, toured the facility and learned about the opportunities available to those who pursue a career as a member of the Carpenters Union. Vendors, retailers and carpenter organizations were on hand with exhibits and informational handouts. The small group guided tours of the training facility gave students and their instructors the opportunity to see professional union carpenters and apprentices showcasing their skills in the following areas: flooring, interior systems, infection control risk assessment, exterior siding, residential wood framing, scaffold erector certification, cabinet installation, door hardware, finish carpentry, stair layout & framing, concrete formwork, structural insulated panel systems, insulated concrete forms, pile driving and under water welding. A committee of retired members from Boston-area local unions affiliated with the New England Regional Council met today to discuss establishing a retirees group. Preliminary discussions involve inviting retired members to participate in social, educational and union-building activities. Stay tuned for more information on how the group will operate and how retired members can get involved. More than 50 members, representing ten local union affiliates of the New England Regional Council of Carpenters, gathered in Salem and Pelham, New Hampshire Saturday to knock on some doors. Members canvassed in support of President Barack Obama, Gubernatorial candidate Maggie Hassan and Annie Kuster, Second District candidate for United States House of Representatives. They visited with both union carpenters and members of the general public for several hours. United States Senate candidate Elizabeth Warren visited the Carpenters Center recently to speak with members about issues of specific interest to union carpenters. She took questions from members and spoke individually with members before and after the event. Thank you to Elizabeth Warren for coming by and thank you to every member who cared enough to come out and get involved. Weather didn't deter members of Carpenters Local 26 on Massachusetts' north shore. They turned out and stood up for their friend, Congressman John Tierney, who is facing a tough re-election battle. The massive wage and hour violations at the Boston Copley Marriott, which were investigated only after loud and repeated protests by union carpenters joined by other trades workers and union workers has hit the news again. This time reported by HR.BLR.com, a site that reports on business and legal issues pertaining to human resource management. The article lays out the nearly $1.2 million in violations by numerous contractors hired to renovate rooms at the high-priced downtown Boston hotel, including one that misclassified 28 employees as independent contractors and failed to report more than $410,000 in wages and another that failed to report more than $460,000 in wages to the Department of Unemployment Assistance. Come find out about the Wentworth program! Wentworth will be presenting information about registration, fees, and other requirements to participate in their Construction Management Associates and Bachelor degree programs. Graduates of our apprenticeship program will receive 22 college credits toward their degree. All carpenter participants will receive one-third off of their tuition at Wentworth. Participants at either session may register with Wentworth. The sessions will be held at the Carpenters Center in Boston, MA, and the New England Carpenters Training Center in Millbury, MA. New England Carpenters Training Center -- October 13th 2012 @ 9:00 a.m. The Carpenters Center (2nd Floor) -- October 17th 2012 @ 5:00 p.m.
New England Carpenters Training Center -- November 7th 2012 @ 5:00 p.m.
For more information about this partnership click here. Governor Deval Patrick yesterday announced a boost to funding for new buildings on state college campuses, a positive steop to boosting infrastructure, education and employment in the construciton trades. 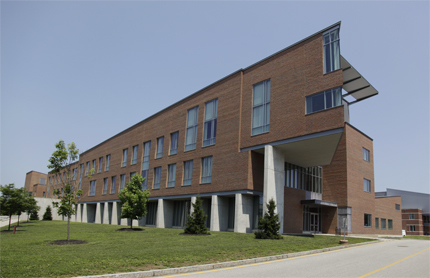 --A new academic classroom building at the University of Massachusetts Boston, estimated at $100 million to help address the demands of continued enrollment growth at the University and the drive to provide an academic setting in which cutting edge teaching techniques can be accommodated. Learn more about The Highlands renovation project, by clicking here to view the project in our portfolio. Members in Rhode Island have been helping families faced with one of the harshest realities of a volatile economy, homelessness. For many years, members of Carpenters Local 94 have been raising funds for the Rhode Island Family Shelter, located in Warwick. Carpenters Local 94 holds an annual Dollars for Food Drive to raise money for the shelter.In addition to the monetary donations, carpenters have volunteered time and labor on site to help with various projects throughout the facility. These projects include a complete renovation of the basement, creating meeting space and a large playroom. Mark Erlich, Executive Secretary-Treasurer of the New England Regional Council of Carpenters announces the union's endorsement of former Governor Angus King for United States Senate. The text of his entire statement is below. "My name is Mark Erlich and I’m the head of the New England Carpenters union. "We’re proud to have close to 20,000 members in Maine and the region’s other five states under our umbrella. And if anyone thinks they all look the same, act the same or think the same, I’m here to tell you that’s not the case. They don’t even sound the same. But there is a core set of beliefs -- the desire for decent wages, quality benefits and safe jobsites. Our members hold a variety of views on social issues, but they all know that “the best social program is a job”. "We believe in partnerships. We know that in order for our members to succeed, our employers have to be competitive. We invest in training to ensure that quality and productivity offers a higher value for project owners. We provide contractors flexibility in hiring. And we have created a culture where hard work on the job and involvement in the community and our democracy is expected, not just suggested. "Frankly, we’re pretty proud of the way our union is able to balance different interests in our industry. We look for the same in politics. "We value the kind of independence and balance that Angus King represents. "He’s been an entrepreneur, a fan of capitalism, but recognizes our system is not always perfect. Angus King knows that some regulation can go too far and shackle our economy. But he also knows that the abuses we saw four years ago in the financial system are unacceptable and have left a legacy of destruction in our industry and its workforce. "Angus King has written critically about some of the trade agreements that the United States has negotiated. He has called for fair rather than free trade so that local workers and businesses that play by the rules are not undercut and subjected to unfair competition. "Angus king is a fair and thoughtful man whose experience and independence are unquestioned. At a time of gridlock in our nation’s capital where scoring political points has become more important than salvaging our economy, Angus King will stand out as a voice of reason. Angus King knows that government can and must provide needed checks and balances. "Like our union, Angus King is committed to solutions, not slogans. For all these reasons, the New England carpenters are proud to support Angus King as the next senator from Maine. Today, the New England Regional Council of Carpenters issued a report card on Senator Scott Brown’s failing efforts to support job-creating programs and middle-class families across the Commonwealth. Senator Brown received an F on today’s report card for opposing numerous jobs bills that would have supported thousands of good-paying jobs in Massachusetts, opposing the extension of essential unemployment benefits, and failing to fight for fair wages for working men and women. - Would not add to the deficit. Marriott management "asleep at the switch"
Banker and Tradesman ran a piece this past Sunday about the lack of awareness shown by property owner Host Hotels & Resorts Inc. and Marriot management regarding what was happening on their $18 million renovation project. Earlier this year, Union carpenters, painters and other union members demonstrated twice a week for months at the site against Baystate Interiors, Inc. of Woburn for undermining area standard for carpenters' wages and benefits. Read the Banker and Tradesman piece in its entirety here. The Stamford Advocate ran another piece covering the areas standards demonstrations at the Harbor Point apartment complex. Contractors working for Harbor Point developer Building Land Technology (BLT) are working in Connecticut but not hiring Connecticut workers, not paying Connecticut wages and not meeting are safety standards. The Connecticut Department of Labor's Wages & Workplace Standards Division has issued 34 "Stop Work Orders" to contractors working at Harbor Point over the last two years, continuing a string of bad practices and bad press for the city and the project's developer, BLT. 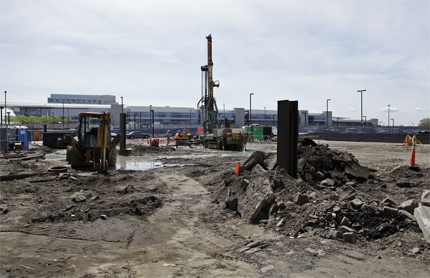 "It's disheartening to see so many out-of-state workers on the job at Harbor Point because the unemployment rate in the construction industry in Connecticut is twenty percent to thirty percent,"said Tim Sullivan, Local 210 Organizer . As a result of the the protests by union carpenters at the Boston Marriott Copley Place renovation project, state investigators found improper activity by fifteen companies that worked on site. Contractor’s working on the renovation project failed to report $1.2 million in wages, which cost the state $86,000 in taxes. Investigators from the state task force on the underground economy also found that 63 employees were misclassified as independent contractors. Earlier this year, Baystate agreed to pay $31,000 in back wages to 37 Victory Outreach workers who received illegally low wages for 3 months of work. Read more about Victory Outreach here. Unfortunately, state law protects the privacy of companies accused of tax violations. Even in a case like this, with widespread labor violations, investigators are blocked from state laws from charging contractors and property owners. Read more about the results of the investigation by the state task force online here. To view a PDF of the article, click here. Labor organizer Manny Gines looks like the professional ex-boxer he is. His clean-shaven head is anchored to a solid, stocky frame with tattooed arms and strong hands. But it is his eyes that acutely betray his former pugilistic days. They look at you measuredly, as if working out the timing of a right cross or left uppercut. His battleground is no longer in the boxing ring, however. It is in the local trenches of the country’s underground economy. For years now Mr. Gines has been visiting and picketing construction sites at which he suspects the presence of illegal work activities. He is constantly working with clients who come to him with claims of being abused, underpaid or not paid at all by their employers, a role that has placed him on a first-name basis with those in the state attorney general’s office who monitor the underground economy. A union member fighting on behalf of non-unionized and oftentimes undocumented workers would seem counterproductive, but Mr. Gines sees himself as protecting legitimate businesses from unscrupulous employers. Over Labor Day weekend, the Worcester Telegram & Gazette ran a story about the impact of the recession on the construction industry. While the story mentions that “over the last six years, the construction industry in Massachusetts has lost almost a third of its jobs” it also talks about the success of two Local 107 apprentices, who joined the Carpenters Union in the middle of the recession and have worked steady since. Read the entire article online here. For a PDF version, click here. 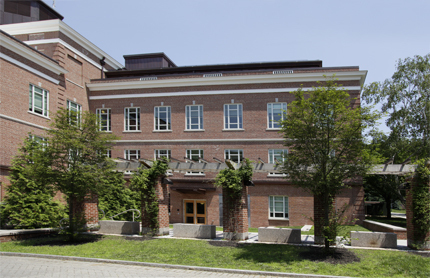 Learn more about the Congreve Hall renovation project, by clicking here to view the project in our portfolio. Learn more about the James Hall project, by clicking here. Learn more about the Kingsbury Hall project, by clicking here. Learn more about the Service Credit Union building project, by clicking here to view the project in our portfolio. Learn more about The Victor project by clicking here to view it in our online portfolio. Come out for a fun family day! NERCC members and their families are invited to join in Free Family Fun at the CambridgeSide Galleria. The day officially begins at 8:30 AM with registration for the kids-only duathlon with biking and running in and around Cambridgeside Galleria. Registration starts at 8:30 AM and the event begins at 10 AM. While the racing competition is in the morning, the Mall and surrounding parks will have activities throughout the afternoon. Event staff will be collecting new, unused school supply items for donation to the East End House the day of the event. You can register online or onsite the morning of the event. For more information, check out this flyer or visit ShopCambridgeSide.com. The Boston Globe reports on economic concerns in Massachusetts, where a net reduction in jobs occurred for the first time since November. Though the unemployment rate is fairly steady, concerns are mounting that the slow recovery could be slipping away. NERCC's Mark Erlich is quoted. Volunteer carpenters were an integral part of a United Way project in Framingham, MA, transforming the former Framingham RMV Building into the new United Way Pearl Street Cupboard and Café. The facility is capable of serving more than 1,000 customers a month. Learn more about the project, including a video profile piece, by clicking here.